This experiential session is for anyone, with or without experience, who is curious about the Do-It-Yourself (DIY) / Do-It-Together (DIT) movement, and how it can help libraries. Come join LITA at Noisebridge, for a day at one of the first US hackerspaces. In the morning, attendees will learn to solder their own limited edition LITA project, learn the basics of electronics, and leave not only with the projects they made and inspiration to experiment on their own, but also with ideas for implementation of hackerspaces in their libraries. There will be an afternoon panel lead by a Silicon Valley inventor and library colleagues from School, Public and University Libraries that will provide different perspectives of how a hackerspace and its programming can provide a catalyst for lifelong learning in students/patrons, and how libraries can remain relevant and supportive far into the future. The discussion will include helpful hints to decide what type of space and tools are is right for your institution. Finally there will be a choice of experiential small group projects along with tours of the space. 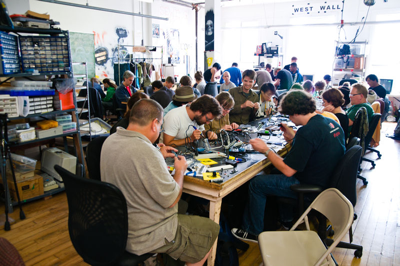 The fun will take place at the well known Noisebridge hackerspace. Accessible using the BART system. 2015, ALA Annual Conferences, News & Noteworthy Arduino, Hackerspace, makerspace. permalink.